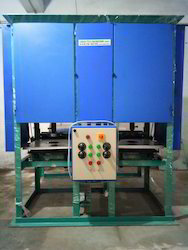 Leading Manufacturer of pattal making machine and fully automatic pattal making machine from Surat. We are one of the noteworthy enterprises engaged in offering superior quality Pattal Making Machine. This machine is used for manufacturing pattal plates. The offered machine is a semi automatically unit that needs manual feed of raw material and die cast impression. The offered machine is widely used for making only pattal in the domain. Max Plate Size 4"-8", 4"-10"
We are counted amongst the recognized organization offering of premium quality Fully Automatic Pattal Making Machine. The offered machine producing 100-120 pieces per minutes.Pattal dish material weighs up to 65 grams. Entire such efficiency counts to manufacture 3200 pieces per hour.